Rachael Ray Cucina Melamine Nesting Measuring Cups, 5-Piece Set, Assorted, Lowest Price! These make a stellar housewarming gift or a nice addition to your baking tools! 🙂 Amazon has the Rachael Ray Cucina Melamine Nesting Measuring Cups, 5-Piece Set, Assorted now on sale for $11.79 (reg. $14.99) shipped, which is the lowest price we’ve seen! Measure those cooking prep steps out with a lot less fuss and a lot more fun, with easy to use, clean and store Rachael Ray(r) Cucina Melamine Nesting Measuring Cups. Rachael Ray(r) designs kitchenware just the way she cooks: to make kitchen time easy and meals that are delicious and not difficult. These nesting measuring cups are the perfect set for quickly scooping up dry and wet ingredients and having them right at hand while you cook. 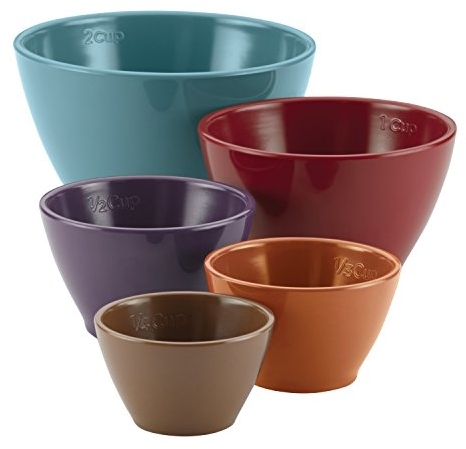 The measuring cups come in five standard sizes, each identified by its own distinct, distinctive Cucina color. The measurement capacities are marked right on the inside rims and the cups stack inside each other from smallest to largest for compact, nothing-to-it storage. The perfect complement to all the clever, colorful kitchenware from the Rachael Ray(r) Cucina collection, the measuring cups are constructed from sturdy, BPA-free melamine. Use the small measuring cup to keep pinch of salt and other seasonings at hand, the mid-sized ones to hold liquid ingredients or minced herbs and the largest for flour, chopped onions and more. Best of all, the cups go right into the top rack of the dishwasher to keep the cleanup as unfussy as the cooking. Make all those fave foods without making a fuss, with the colorful, convenient Rachael Ray(r) Cucina Melamine Nesting Measuring Cups and keep kitchen time simple. Expired: Save on Select Brita Pitchers and Dispensers!